North East India | Untamed Borders - Adventure travel..
Wedged between Tibet, Mynamar and Bangladesh the North East of India is a treasure trove of tribal groups, remote Tibetan monasteries, nature reserves, and tea plantations. Many of the states require permits to visit them, both for foreigners and for other Indians. This combined with its remoteness from the rest of India, only attached by a thin strip of land affectionately known as the “Chicken’s Neck” results in an outstanding area almost devoid of international tourists. As with our other destinations we believe that interaction with people is key to a memorable trip. Our relationship with local people allows us to join Adi tribesmen on a traditional hunting trip, stay over night at a monastery with Buddhist nuns, meet a Bon Shaman and dine with men who were once head-hunters. Cherrapunjee has the most rainfall annually than anywhere else in the world. Averaging 12 metres of rain a year. Once it had a metre of rain in a day. 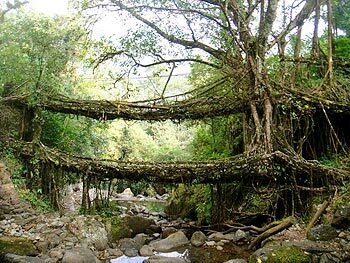 As you might imagine the area suffers a little from damp and the Khasi villagers have created a unique solution to the problem of rotting bridges in the hot and humid monsoon months. They guide creepers of Banyan trees across the rivers and over the years they thicken and a solid living bridge is created. Looking like something from a film set these organic wonders are found nowhere else in the world. Hidden in a valley surrounded on 3 sides by Bhutan and Tibetan China Tawang is a vast valley preserving the typical Tibetan way of life that is fast disappearing. 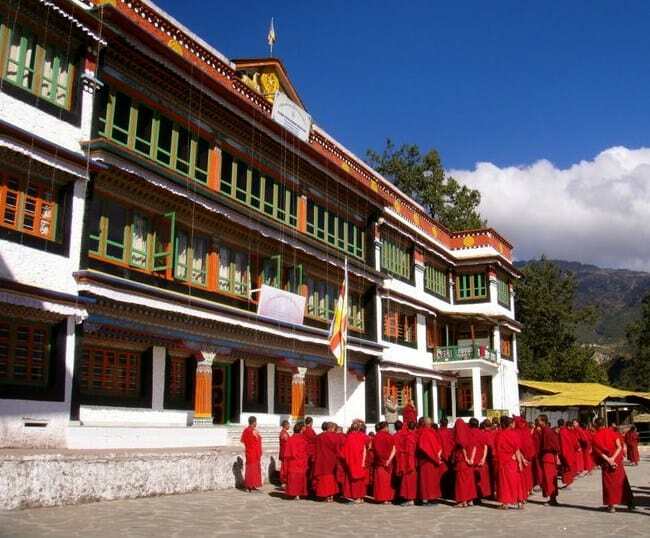 Most famous for its huge 500 year old monastery the valley is also dotted with splendid view points, waterfalls and other monasteries and nunneries. Our local knowledge of the area allows us to overnight at one of the nunneries as well as at local villages including a village in which they still worship Bon. The ancient animist religion that existed in Tibet before Buddhism arrived. In fact the Grandfather of our guide to the region was a Bon Shaman. The Apatani are unusual in that they are completely settled and only live in one small valley in Ziro. Due to their lack of space they have developed a sustainable farming system. For every tree they cut they plant five and they famously use the water in their paddy fields to cultivate fish. Their villages are closely packed. The Apatani ladies are renowned throughout Arunachal Pradesh for their beauty. In the past Nyishi warriors would charge into Ziro and carry off the most beautiful women. To prevent this the Apatani women had their faces tattooed and huge plugs put in their noses and ears to disfigure them so as not to be found so attractive. This practice has ended but some of the older women still have the tattoos and plugs. Although many people cannot point to Assam on a map they know what it’s main export is. A drive through Assam reveals vast tea plantations with pickers sporting baskets and umbrellas snapping off the tips. On our trips to the North East we try and include some tea activities. From staying in an old colonial tea plantation managers home in Dibrigargh to a private tour around Pei’s families tea estate we can give an insight into the realities of the tea industry in India. Nagaland is home of the Naga’s. A loose term to describe the ferocious tribes that occupied this wedge of land that separated Burma from British India. Traditional villages contained a Morung in which all non-married adult males bunked in together ready at any moment to defend the village from other Naga’s or to head off raid other villages. In the past conquered foes had their heads removed and displayed as trophies of war and only recently has this practice ended. Head-hunters can still be found in the villages, recognizable by their distinctive facial tattoos. The Naga’s are also famous for their incredible wooden carvings depicting anything from hunting to opium smoking, head-hunting to farming. We usually take people to Mon district. The villages in Mon are still traditional and include Longwa which is half in India and half in Myanmar, Shangwu, famous for it’s wood carving and Shangwa Nyu with its collection of human skulls and vast house belonging to the Angh (king) of the village. One of the few places to see the one horned Rhino in the wild. In the winter trips can be arranged on Elephants to see these magnificent beasts. The elephants do not disturb the Rhinos and they do not sense that people are sitting on them allowing guests to get up close and personal with these one horned beasts. The Burma Campaign was the longest fought by the British Commonwealth in the second world war. The sites of the key battles of Kohima and Imphal are well preserved as is the Ledo Road, built to provide a land link to Chinag Kai Shek and the Kuomintang in their fight for China against the Japanese army. Places like “The Lake of No Return”, a lake on the Burmese side of the border where Allied planes would crash land if they could not make it home, jungle cemetaries and rolled grassy landing strips bring this little known conflict to life.